After making his debut for Schalke on the final day of the 16/17 campaign, Weston McKennie has already shown what he is capable of during the Royal Blues’ pre-season thus far. The 18-year-old now feels ready to fight for a place in Domenico Tedesco’s starting eleven. McKennie has already got a taste for life in the Bundesliga, having come on for the last 13 minutes of Schalke’s 1-1 draw with Ingolstadt in May. The teenager from the suburbs of Dallas had officially been promoted to the first-team squad just a few days before the game and - based on his performances during this summer – he now seems primed to capitalise on that decision. Haji Wright, another American on Schalke’s books, made headlines by scoring four goals in their first pre-season outing – a 9-1 success against sixth-tier SpVgg Erkenschwick. McKennie, though, has been imposing himself in central midfield and he excelled again during Schalke’s 3-2 win over Turkish champions Besiktas in China. The former FC Dallas academy prospect set up the first goal for French winger Amine Harit with a sumptuous through ball and the Royal Blues led 1-0 when he was withdrawn at half-time. He credits new Schalke boss Tedesco for making it easy for both he and fellow youngsters Wright and Luke Hemmerich - who scored against Besiktas - to shine. “The trainer believes in us,” McKennie told Schalke’s official website. “You can feel that. Tedesco said his young players were doing very well in pre-season and McKennie’s application has not gone unnoticed by other key staff members either. A fan of recently-retired former Roma playmaker Francesco Totti, his poise on the ball, reading of the game and eye for a pass have all stood out in recent weeks. "It’s impressive how Weston is performing with the first-team squad," sporting director Christian Heidel told Der Westen. As a child McKennie spent three years in Kaiserslautern – where his father was based and he played football for the first time in his life, having not known what the sport was until then - and he opted to return to Germany last year despite the offer of a homegrown player contract with Dallas. Less than 12 months after linking up with Schalke’s academy he made his Bundesliga debut and said that Dortmund star Christian Pulisic – a friend from the US national team – was proving an inspiration to every American player in Germany. "We all look up to him and say ‘it's possible,'" McKennie told espnfc in April. "We see him do it and say ‘why can't we do it either?'" 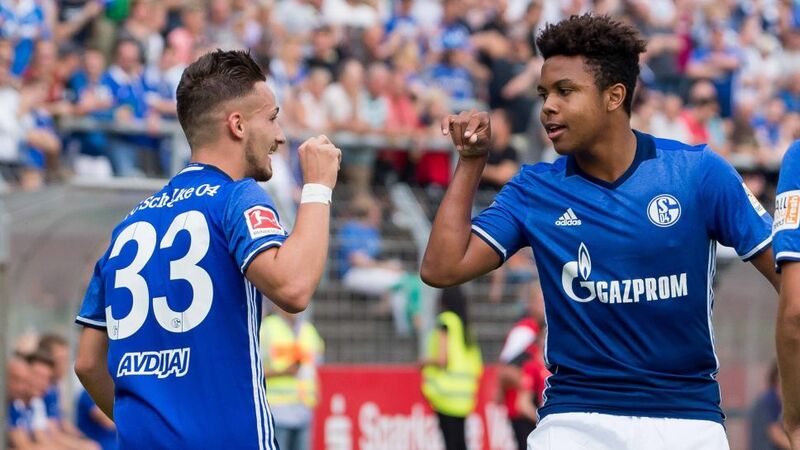 McKennie began his pre-season with 90 minutes and two assists – both goals scored by Wright – in the win over Erkenschwick. He followed up by getting another half hour in a 1-0 victory over Paderborn and then played an important role in Schalke’s 3-4-3 formation for the game against Besiktas. The Texan tyro will be competing with the likes of Johannes Geis and Benjamin Stambouli for the holding role in the Royal Blues’ midfield but he has been offered plenty of encouragement by ex-Erzgebirge Aue coach Tedesco. "Everything is completely open there," Tedesco said when asked about that position. "A degree of rotation can be carried out." McKennie is planning to keep himself in the frame when the new campaign gets underway and insists he is up to the challenge. "I give everything I can every day and try to learn as much as I can from all training sessions,” he told Schalke’s website after the Besiktas game. "There is a lot competition for my place but I like getting stuck in with others. I’m a pretty competitive guy." Watch: McKennie shows off his American Football skills during Schalke's Media Day!